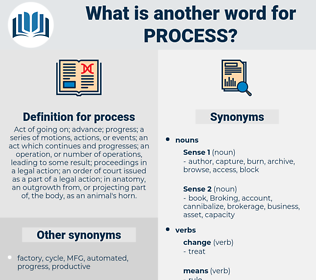 What is another word for process? Act of going on; advance; progress; a series of motions, actions, or events; an act which continues and progresses; an operation, or number of operations, leading to some result; proceedings in a legal action; an order of court issued as a part of a legal action; in anatomy, an outgrowth from, or projecting part of, the body, as an animal's horn. Recommendations, milestones, directions, pharmaceuticals, results, modalities, targets, Permits, Goals, processus, progress, course, courses, proceso. Criteria, data, effort, progress, course, matter, endeavour, pathway, phenomenon, prosecute, evolution. Prosecuted, phased, appreciated, completed, scheduled, associated, involved, documented, started, regulated, oriented, Logged, engaged, tried, drawn. failure, idleness, cessation, inaction, ignorance, halt, inactivity, decrease, decline, stoppage. stillness, about-face, repose, quiet, quiescence, ebb, backwash, rest, immobility. retain, continue, preserve, neglect, keep, hold, forget, remain, ignore. Can you describe the process by which your plans or ideals change? But this is a new process. monition, ticket, process of monition, citation. ray, run, aerate, bituminise, fluoridize, ammoniate, sulphur, irradiate, fluoridate, camphorate, carboxylate, digest, fluoridise, agenise, oxygenize, nitrify, nitrogenise, iodize, fumigate, iodise, dose, mercerise, nitrogenize, agenize, curry, carbonate, scald, vulcanize, chrome, refine, nitrate, propagate, beneficiate, bituminize, vulcanise, brominate, bromate, mercerize, creosote, air-condition, oxygenise, seed, fume, oxygenate, tank, reverberate, malt, sulfur, chlorinate. bear upon, bear on, touch on, affect, touch, impact. compute, work out, reckon, cipher, figure, calculate, cypher.